^ 707 Model Summary. Boeing Commercial Airplanes. [2010-12-10]. ^ 4.0 4.1 Iranian AIRLINE SAHA halts operation due to outdated fleet. Payvand. 2013-04-24 [2014-09-17]. ^ Gamble in the Sky. Time. 1954-07-19 [2009-12-27]. ^ 13.0 13.1 Boeing 707. airlinercafe.com. [2009-12-27]. ^ KC-135E. Global Security. [2009-12-27]. ^ 17.0 17.1 Accident description. Aviation Safety Network. Flight Safety Foundation （英语）. ^ The 707 Family. michaelprophet.com. [2014-09-16]. ^ Aviation History 1961 - 1970. .flightglobal.com. [2014-09-16]. ^ 28.0 28.1 T0WARD8 200-SEAT BOEINGS (新闻稿). Flight International. 1965-03-25 [2012-12-12]. ^ 29.0 29.1 Haenggi, Michael. Boeing Widebodies. Saint Paul, Minnesota: Zenith Press. 2003: 15 and 17. ISBN 0-7603-0842-X. ^ Boeing 707-820: First details of the longer, faster, heavier and more (新闻稿). Flight International. 1965-06-03 [2012-12-12]. ^ 邓小平首访美国的艰难航程. 光明網. 2003-10-10 [2015-02-24]. ^ Aerospace Notebook: Orphan 717 isn't out of sequence. seattlepi.com. [2009-12-27]. ^ Boeing 707 Accident summary. aviation-safety.net. [2014-09-24]. ^ Boeing 707 Statistics. aviation-safety.net. [2014-09-24]. ^ 707 Airplane Characteristics: Airport Planning. boeing.com. [2012-10-12]. ^ Boeing 707 Family. boeing.com. [2009-12-27]. ^ Boeing 707 Family. Orders and Deliveries. [2004-09-16]. Philip K. Lawrence and David W. Thornton. Deep stall : the turbulent story of Boeing commercial airplanes. Ashgate Pub Co. 2005. ISBN 978-0754646266. Jim Winchester. 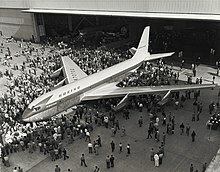 Boeing 707/720. Airlife Publishing Ltd. 2002. ISBN 1-84037-311-3. Tony Pither. The Boeing 707, 720 and C-135. UK: Air-Britain (Historians) Ltd. 2002. ISBN 0-85130-236-X. Civil Aircraft Today. Paul E. Eden. 2006. ISBN 1-84509-324-0. 曾育慧. 飛行簡史：從熱氣球到三倍音速. 臺北市: 商周出版. 2003. ISBN 986-7747-01-1. Bowers, Peter M. Boeing Aircraft since 1916. London: Putnam Aeronautical Books, 1989. ISBN 0-85177-804-6.